Welcome to VL Test Systems ~ Home of the Brake Tester! Vehicle testing equipment specializing in the supply of Commercial Roller Brake testers nationwide . We are The leading suppliers of commercial brake testers for the HGV and commercial vehicle sector, including mobile brake testers, crane brake testers, truck brake testers, bus brake testers and commercial brake testers. We have a specialist team of brake test engineers, located throughout the UK. VLT are a leader in providing DVSA Authorised Test Lane Facilities (ATF’s) and can provide all the equipment & services required for approval. VLT have their own dedicated delivery vehicle and trained installers ensuring that your products arrive to your site and are installed to our high quality standards. VLT’s technical team can manage your project from start to finish no matter how big or small, providing expert assistance at every stage. VLT offer a variety of service solutions and have a fleet of in house engineers throughout the UK who provide after care that is second to none. Here are some examples of our previous installations. Did you catch us in the Press? Below are some of the articles that have appeared in the trade press. So, how can you achieve such longevity from your Roller Brake Tester? Like most things, some of it is common sense, some of it though is easily forgot. Below are some tips for extending the life of your machine. Location, Location, Location ~ if you position your Roller Brake Tester at the bottom of a slope or next to a jet wash, then you can guess where the grime, rubbish and water will end up; in the Brake Tester Pit. Safety First ~ always be aware that with moving machinery and vehicles correct procedures need to be maintained. If you are cleaning your Roller Brake Tester ~ use the approved equipment and follow the correct processes. Before Testing a Vehicle, ensure that there is NO tyre damage, other than reasonable wear. Ensure your vehicle is balanced correctly, before testing it. Check that the load is to at least 65% of design axle weight and that for example one side of the vehicle is not wet and the other side is dry ~ this may impact your results. Do not let mechanics dump oils, hydraulic fluids or antifreeze over the Roller Brake Tester. We actually had one Bus company dump the waste from the on-board toilet over the Roller Brake Tester. Regularly clean out the Roller Brake Tester trays. Where needed ensure the Cover Plate Bolts and the Chains are greased. If in doubt, always call the experts. V L Test Systems service team have years of expertise to support you. We still have staff here at V L Test Systems that were around when the Roller Brake Testers mentioned earlier were installed! 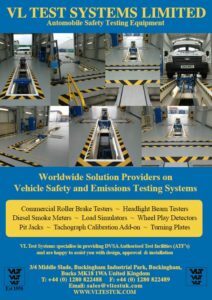 VL Test Systems Ltd (VLT) is a leading UK supplier of High quality Brake Testing equipment and installer of DVSA Authorised Testing Facilities Lanes. Van Leeuwen Test Systems was established in the Netherlands in 1958 and this year celebrates 60 years of Success. Specialising in the supply of Vehicle Braking equipment from it’s very early beginnings, it’s focus these days is very much on the supply and maintenance of High Quality Roller Brake testing equipment for the commercial vehicle market. The UK operation which was established in 1989, was initially set up to complete the installation of Commercial Roller Brake Testers (RBT’s) into the VOSA Goods Vehicle testing stations throughout the UK. It is a measure of the Quality and reliability that the VLT brand represents, that a number of those early Roller Brake testing machines are still performing strongly today, nearly 30 years since they were first commissioned. VLT Design, develop and Manufacture their own Brake Test equipment from their purpose built factory in the Netherlands, which allows them to ensure that the quality is always to the highest standards and that roller brake testing machine development is in line with the advances in technology. The company are the leading experts in the supply of Roller Brake Testers for the Commercial Vehicle market, with their extensive range allowing for the professional testing of Buses, Coaches, HGV’s and trailers, as well as brake testers for light goods vehicles, cars and motorcycles. The Roller Brake Testers are fully computerised, bi-directional, counter-rotational, feature roller locking and come complete with the VOSA Database as well as lifetime updates of this. The Roller Brake testers can be one man or two-man operation depending on specification. The sub frames and roller brakes casings are all hot-dip Galvanised for increased durability and quality. As a result, VLT offer a lifetime warranty on the Rollers as well as providing a five-year warranty on the brake testing motor and gearbox which is the longest warranty in the industry. 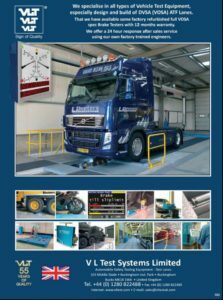 Alongside the roller brake testers, VLT also supply a variety of additional garage and test equipment including Headlight Beam Testers (HBT’S), Diesel smoke meters, Wheel Play Detectors (WPD’S), Axle load simulators, Pit Jacks and all other ATF required equipment and tools. VLT’s experienced team can also assist with the Planning and installation of your Authorised Test Facility (ATF) including assisting you in obtaining the necessary DVSA approvals and sign off. VLT have their own factory trained, highly experienced and dedicated team of service engineers located throughout the UK. This ensures that the servicing and Calibration of your Roller Brake tester and other equipment is completed in a timely manner and to the high standards that VLT customers have come to expect. VLT also have their own dedicated and highly trained roller brake installation team, as well as their own lorry, which ensures that the roller brake equipment is always delivered and installed by their own staff, providing a High quality installation every time. As well as the long standing relationship that VLT has with the DVSA, a number of key roller brake customers also include the likes of Arriva, Stagecoach, London United, Centurion Travel, Lodge Coaches, Scania & Volvo. VL Test Systems also work with the Ministry of Defence, servicing Roller Brake Testers and other test equipment which they have installed throughout a high number of the UK bases, as well as in overseas locations such as Afghanistan, Canada, Gibraltar and the Falklands. VLT have a dedicated Roller Brake Technical sales team who can assist you with any stage of the purchase and installation of your Brake Test equipment to ensure you get the right solution to meet your brake testing and vehicle maintenance needs. They pride themselves on managing your roller brake testing project from start to finish, which includes planning layout design, issuing technical drawings, arranging civil works, installation of your brake testing equipment and arranging after sales care. 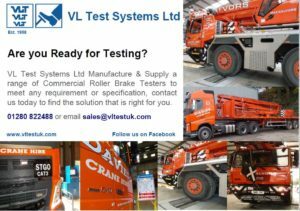 VL Test Systems Ltd (VLT) is a leading supplier of High quality brake testers. Van Leeuwen Test Systems was established in the Netherlands in 1958 and has now been specialising in the supply of High Quality Vehicle brake testers for nearly 60 years. The UK operation established in 1989 was initially set up to complete the installation of Commercial Roller Brake Testers into the VOSA testing sites and a number of those early machines are still performing strongly today, a measure of the Quality and reliability the VLT brand Represents. VLT Design and Manufacture our own brake tester equipment from their purpose built factory in the Netherlands, which allows us to ensure that the quality is always to the highest standard and machine development is in line with the advances in technology. Our company are experts in the supply of Roller Brake Testers (RBT’s) for the Commercial Vehicle market, with their range allowing for the professional brake testing of Buses, Coaches, HGV’s and trailers, as well as brake testing light goods vehicles, cars and motorcycles. The roller brake testers are bi-directional, counter-rotational, feature roller locking and come complete with the VOSA Database as well as lifetime updates of the database. The sub frames and roller brakes casings are all hot-dip Galvanised for increased durability and quality. As a result, VLT offer a lifetime warranty on the Rollers as well as providing a five-year warranty on the roller brake motor and gearbox. Alongside the Roller Brake Testers we also supply a variety of additional equipment including Headlight beam testers, Diesel smoke meters, Wheel Play Detectors, Axle load simulators and all other authorised testing facility required equipment. We can also assist with the Planning and installation of your Authorised Test Facility including the necessary approvals. We have our own factory trained, highly experienced and dedicated team of brake test engineers located throughout the UK. This ensures that the installation, servicing and Calibration of your Brake tester and other equipment is completed in a timely manner and to the high standards that VLT brake tester customers expect. As well as the long standing relationship that VLT has with VOSA, a number of key customers also include Arriva, Scania, Volvo, Stagecoach and Tesco. We also work with the Ministry of Defence, servicing Brake Testers which they have installed throughout a high number of the UK bases, as well as in overseas locations such as Afghanistan, Canada, Gibraltar and the Falklands. We have a dedicated brake tester Technical sales team who can assist you with any stage of the purchase and installation of your brake testing equipment to ensure you get the right solution. We pride ourselves on managing your project from start to finish, which includes layout design, technical drawings, arranging civil works, brake testing installation and after sales care. VL Test Systems Ltd (VLT) is delighted to announce a new contract with the Ministry of Defence (MOD). The Contract which commenced on 1st March is for the Calibration, Repair and Maintenance of the MOD’s fleet of VLT Roller Brake Testers (RBT’s), Headlight Beam Testers (HBT’s) and Wheel Play Detectors (WPD’S) within the UK and overseas locations. 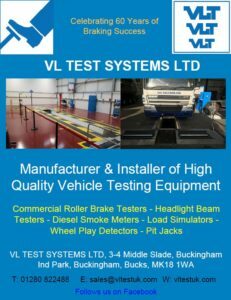 VLT is a leading manufacturer, installer and maintenance provider of high quality Vehicle testing equipment. VLT has a long standing relationship supplying services to the MOD and is delighted to have won this contract which represents a continuation of this successful partnership. For further info on this contract or to find out more about VLT’s range of products please visit www.vltestuk.com or contact sales@vltestuk.com.